It was less than six months ago when Netflix premiered “Chilling Adventures of Sabrina.” The series is a spinoff of the CW’s unlikely hit “Riverdale,” itself a darker reboot of the “Archie” comics. “Sabrina” was initially created for the CW as a companion show to “Riverdale” based on the Archie spinoff “Sabrina The Teenage Witch” comic series, but Netflix outbid the broadcast network. Though the promise of a bigger budget was part of the allure for showrunners, Netflix also promised the production a guaranteed two seasons, something the CW simply couldn’t do. As it turns out, this guarantee is not really what the show got. If it had run as a full season on the CW, the show would have aired 22 episodes, with a winter break in the middle — as the terrestrial television schedule has done traditionally for the last several decades. Under Netflix, “Chilling Adventures” has aired 20 episodes, ten of which arrived in the fall and nine of which arrive this week, with a holiday special in between. In short, the deal with Netflix has actually netted the production two less episodes than it would have gotten at the CW. This "part two" doesn’t even really feel much like a season two. Things have changed, of course: Sabrina now goes to her Academy of the Unseen Arts more than she does the human-based Baxter High, and yet somehow she’s still turning up for drama classes in both schools when the plot calls for it and using her dual student citizenship to hit up all formal dances no matter which gym they’re held in. She and her human boyfriend have broken up and she finds herself dating a warlock instead. Satan, aka the Dark Lord, is starting to come around more and more. Meanwhile, the adult cast of Richard Coyle, Michelle Gomez, Miranda Otto and Lucy Davis all continue to merrily chow down on the scenery with gusto when required. If anything, releasing the show in chunks fixes the chronic pacing issues that “Riverdale” regularly suffers from. "Riverdale” can be slow sometimes, but when the plot moves forward, it does so with sudden jolts. Dropping “Sabrina's” parts one and two six months apart forces the story to meander less. But the format also means there’s nothing different or special about the show being on Netflix as opposed to the CW. There was once a time when shows being on Netflix suggested they would be higher quality or experienced differently. In the case of “Sabrina,” that’s just not true. Fans are merely getting a compact version of the old broadcast format, with a niftier logo and less commercial interruptions. Indeed, as Netflix moves to a model where the streaming service relies more on its own content, it’s increasingly starting to resemble the TV landscape it once sought to disrupt. The streaming service started out as a Silicon Valley tech company, not an entertainment company. Thus when Netflix first began making its own streaming content back in 2013, the entire point was that shows wouldn’t be distributed in the traditional model, nor would they be canceled for not having enough eyeballs watching. The old model was for the dinosaurs who cared about ad dollars. A subscription model provided creators with the freedom to go wild. And viewers could become invested in these strange arthouse shows without fear of seeing them up and disappear simply because they weren’t popular enough with mainstream viewers. When Netflix first began making its own streaming content back in 2013, the entire point was that shows wouldn’t be distributed in the traditional model. 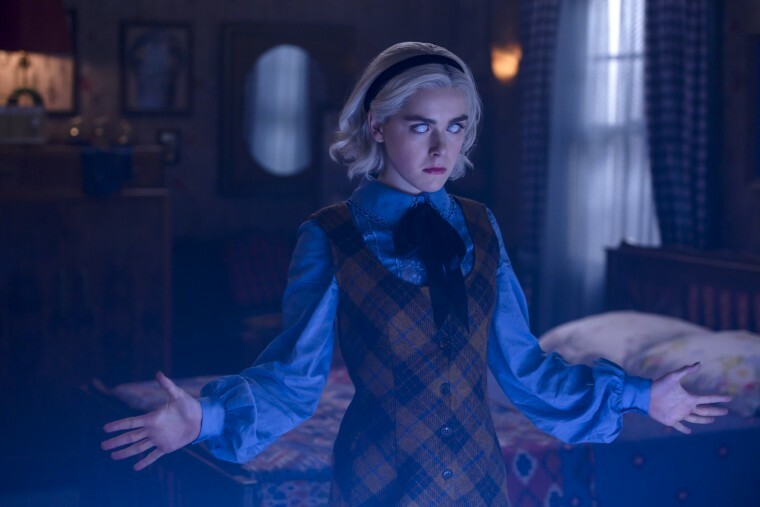 With “Sabrina,” Netflix may be indicating a willingness to change the way it distributes original content and pivot away from the massive episode drop. After years of following the model established with “House of Cards,” Netflix is now dropping two seasons six months apart. It’s still a bingeable length, easily digested in a weekend. But by releasing the installments closer together, Netflix is keeping itself and the show in the news cycle more often, giving the service a chance to put its new offerings in front of viewers more times a year. This isn’t to say Netflix has stopped innovating altogether. “Russian Doll,” for instance, is exactly the type of show that's too niche, too weird and too risque for traditional broadcast. But “Chilling Adventures of Sabrina” was never that type of programming. It was meant to be a CW-style show, and despite being produced by Netflix, it still is one. Like many of Netflix’s crown jewels, it is the type of series audiences could technically watch elsewhere. Now they can even watch it in a similar manner to the style with which they were originally accustomed. If the release model works, and there’s little to suggest it won’t, fans should expect to see Netflix move more shows into fall and spring (or winter and summer) season formats. It is, after all, how the entertainment landscape has worked for many years. In the end, the need for eyeballs trumps all.